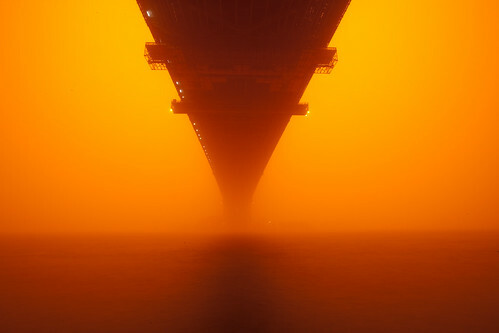 The dust is finally starting to clear from Sydney, leaving a ruddy orange layer of muck all over the city. 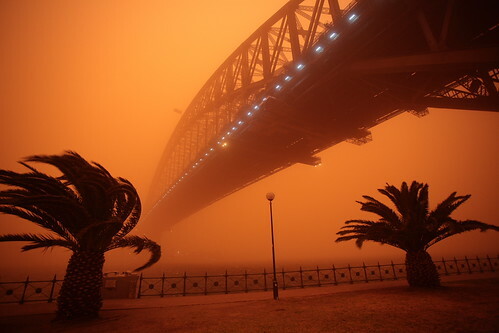 This podcast goes with our previous article Red Sydney, and as well as being a description of the science involved, is a video slide show of photos of the dust-storm. All the photos in this enhanced podcast come from flickr and are available to use under Creative Commons licences. And after you've checked out the above podcast and photo links, have a look at this - this is a video of a couple driving into a dust storm in Broken Hill, NSW. Amazing! Waking this morning was a very eerie experience. Blood-red light peaked through the sides of my blinds, and given I was half asleep at the time, I thought the four horsemen of the apocalypse had come to Earth. When I shook the haziness from my head and peaked outside, the view was astonishing. Not surprisingly, Twitter had loads of comments and on-the-fly photos, and the TV and radio news broadcasts were full of dust-storm stories. Dust storms are not uncommon in Australia - indeed, central and eastern Australia are a major global source of atmospheric dust, and this particular storm, estimated to be 600 km long and dumping 75000 tonnes of dust into the Tasman Sea every hour, could be headed to the New Zealand ski-slopes (that'll teach you to beat us at rugby). Dust can travel a very long way in the atmosphere, with dust from Chinese storms found in the French Alps. The storm has its origins in the Indian and Southern Oceans, where low pressure storms create severe cold fronts. Low pressure air sinks to the ground, forcing hotter, higher pressure air upwards. This can cause thunderstorms, and on Monday, winds of more than 100 km per hour formed in South Australia. As inland Australia is in drought, the winds picked up dust not fixed to the ground by vegetation. 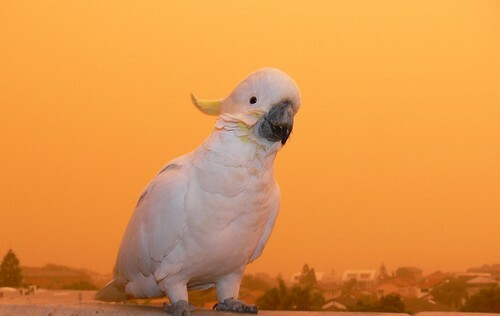 The dust likely came from the Lake Ayre Basin, according to ABC Science Online, and has caused the worst pollution ever seen in NSW. The reddish colour of the sky is an interesting phenomenon. Normally during the day, the sky is blue. This is because of Rayleigh scattering. Shorter wavelength light from the Sun (blue) is scattered by the air in all directions to a greater degree than longer wavelength light (red). The amount of scattering is related to the fourth power of the wavelength - blue light with a wavelength of ~400 nm is scattered about 10 times more efficiently than red light (~ 700 nm). The scattering in this case is mainly due to oxygen and nitrogen molecules smaller than the wavelength of the light. Due to the scattering of blue, when you look directly at the Sun, you see more of the longer wavelength light, which is why it appears yellow. The rest of the sky is lit by the diffuse scattered blue light. At dawn and dusk, the Sun's light has to travel through more of the atmosphere to get to your eyes as it comes in at a tangent to the Earth (go on, draw it...). This means even more blue is scattered and a larger piece of the sky looks a even deeper red. Dust particles are quite large compared with oxygen and nitrogen, and so do not scatter light in the same way. Some dust absorbs light more effectively at blue wavelengths than at red wavelengths, meaning that light shone through it will appear more red. Dust also scatters sunlight, but as the particles are large, this scattering is independent of wavelength. This means that the dust particles act something like tiny mirrors, diffusing the light throughout the sky. This is why the red colour was so intense at dawn - as the light that hit the dust was already red due to Rayleigh scattering, it was then scattered throughout the whole sky. Normally at sunrise, the red colour is confined to only a small part of the sky. The presence of dust (and pollution for that matter) can cause beautiful effects. As the sun climbed higher in the sky today, the red colour softened. 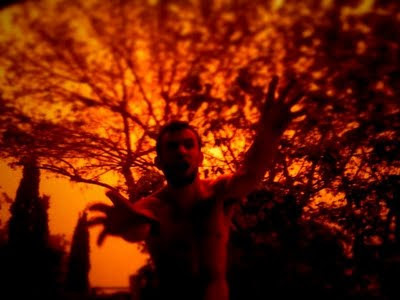 Eventually the sky just looked a dirty orange - the colour of the iron-rich dirt. Here are some of my favourite pics from today - the above zombie was found through @ozdj. I received the following Godzilla pic in an email and found it on flickr, but I don't know who the originator is. It is brilliant. None of these images have been manipulated - yes, it was back to the 60s with sepia Sydney today! Also see the Red Dust Collection and The Red Sydney Project. More dust storms are predicted for this week, so stay tuned. This week saw the publication of a story that "more than half of all Britons have been injured by biscuits." The story received plenty of coverage in the British national press, and if true, is surely one of the UK’s most pressing Occupational Health and Safety concerns. Australian’s are culturally similar to Britons, so I asked around the office and found that no one around here had ever been injured by a biscuit. So I thought back to my 18 months in the UK and to my recollection I was never injured by a cookie, and I certainly don’t remember a horribly outrageous and dangerous biscuit-eating culture. Is biscuit-eating really an extreme sport in the UK? It's quite hard to know where to start with this article, but it is almost the perfect example of "how not to report science in the newspaper." We’ll start with the actual reporting before dealing with the science behind the story. The early claim that "more than half of all Britons have been injured by biscuits" is diluted a little in the following paragraphs, in which it becomes "an estimated 25 million adults have been injured while eating during a tea or coffee." Injured while eating during a coffee break covers a lot more than being injured simply by eating a biscuit. But a quick look at the original "scientific report" (see later) mentions nothing about 25 million adults in the UK (roughly half the population) being injured in such a way, nor is it possible that anything in the report could be extrapolated to such a number. The company that conducted this research, Mindlab International, states that their study says nothing about the proportion of people being injured in this way and that they have no idea where the number came from. The article then goes on to say that "at least 500" people have been hospitalised because of their injuries. This is a slight difference to 25 million, and indeed 500 out of 64 million people in the UK is such a small number that it is hardly worth reporting. You can see where the number 500 comes from by looking at The Home Accident Surveillance System 2002 report. "one man even ended up stuck in wet concrete after wading in to pick up a stray biscuit,"
being bitten by a pet or 'other wild animal' whilst trying to get their biscuit. It’s at this point you start to wonder why any of this was reported at all. Well, the study was commissioned by Rocky, a type of biscuit made by Fox’s. 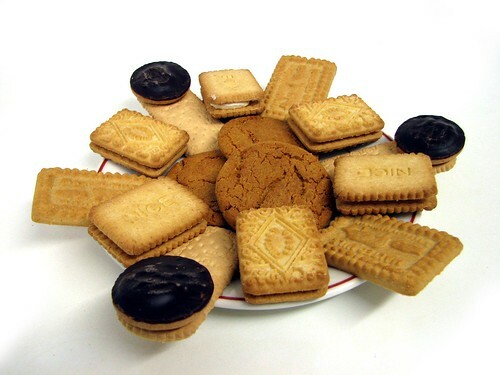 You’ll note how they are the only example of a biscuit given in the above list – all the rest are generic biscuit types. What we have here is a perfect example of a company trying to get some publicity by commissioning a pseudo-science study and putting out a press release. Because "science" and "maths" are used in the article, an impression of credibility is given to the story. This is precisely why people say things like "you can prove anything with statistics" and think anyone with an interest in science is either mad, a boffin or has no connection to the real world. It’s ludicrous that this kind of story can make it into the UK national press, and it’s dangerous because it not only gives people the wrong impression of science, but some people might actually believe it! And whatever happened to fact-checking journalists? Are we so short on news that this gets reported as such? Ben Goldacre has a nice article on how companies use "news" like this to get around advertising rules. It makes me sad that advertising, which at least most of the time we know is advertising, has rules against misinformation but that news articles don’t. "The study, supervised by Mindlab International Ltd scientists, involved ten students aged 16 -18 to investigate the physical properties of biscuits." So this report was done by high-school students? Pretty isn’t it? Looks complicated, it must be correct. One of the weird things about this report is that every equation looks to have been scanned in from somewhere else – not that this influences how we analyse it, but it doesn’t look very professional. There are two parts to this equation: biscuit dependent and consumer dependent factors. Biscuit dependent means the factors that are derived from biscuit behaviour, and consumer dependent means the factors found through survey data – these are not given or explained. Eye/ear/trachea irritation caused by crumbs. Scalding – due to splashes caused when a piece of dunked biscuit falls into hot liquid. Back Injury, hernia, muscular problems from picking up dropped biscuit pieces. TMJ (temporomandiular joint) syndrome to jaw by frequent biscuit chewing. Workplace injury due to being distracted by the sound of biscuits being broken. Dental Damage due to biting on a hard biscuit or something within the biscuit, such as a nut or piece of hard chocolate. Going on a bear hunt does an excellent review of the whole sorry saga, including a look at the role of Mindlab International – the blog lists its "favourite plausible fudge factors, false assumptions and downright crazinesses" - check them out for a good laugh. A breaking biscuit has a noise level of between 5 - 15dB. This is apparently loud enough to cause injury through distraction in the workplace. A typical whisper is 20dB - rustling leaves are around 10dB. I would estimate that my generally quiet workplace operates with about 35dB of background noise, and if I have my ipod on, then that's probably about 60dB (louder when I turn on angry music and read reports like this one). The report models a crumb getting in your ear as equally likely as getting in your eye. This seems a bit like the famous Seinfeld spitting incident – the crumb would have to rise upwards from where the biscuit is broken, then curve back around into the ear. That’s one magic luggie crumb. For obvious safety reasons, laboratory work did not involve trials in which vulnerable body parts were repeatedly impacted by biscuit crumbs! Careful of those deadly crumbs! Our unique research methodology combines hard neuroscience and sophisticated mathematical analysis to provide reliable and timely answers of immediate practical benefit. Given that the survey data was given to them by the company that commissioned them to produce the research, that rather spurious analysis was done by high school students, and that there is absolutely no practical importance in this work, I think they pretty much failed their own mission statement. This kind of thing is fine for generating an interactive tool for a biscuit website – indeed it is fun – but let’s not dress this up as science or news. Following on the heels of our Science of Cocktails podcast, we have an episode for the morning after – The Science of Coffee. At the recent Science of Coffee event at Lushbucket Cafe as part of The Ultimo Science Festival, I spoke to Rafael Bartkowski from Campos Coffee about the scientific method of making coffee, the most important steps in the process, how to decaffeinate coffee and where in the world you can find the best cup. To go with the podcast, here is a quick description of how Campos Coffee decaffeinates their coffee. Campos uses the Swiss Water Process. This method does not use organic solvents, and so is claimed to be better for you. To perform the decaffeination, the first step is to soak green coffee beans in hot water. This releases the caffeine, as well as other soluble compounds within the beans. These other compounds contribute strongly to the taste of coffee – let’s call them “flavour compounds” - and so these particular beans must be discarded. The water solution now contains caffeine and flavour compounds. Caffeine is then stripped from this solution by means of activated carbon filters (see below for a brief description of this process). With the caffeine now stripped from the water solution, we are left with a solution of flavour compounds – this solution becomes “flavour-charged” (the company’s description, not mine!) A new batch of green beans is then soaked in the flavour-charged solution, releasing caffeine but less of its flavour-compounds, as the solution is becoming saturated. This solution is again decaffeinated by a carbon filter, and new beans are added. This process is repeated until the flavour-charged solution is saturated with flavour-compounds, but crucially not caffeine as the caffeine is stripped from the solution after each soaking. After a number of repeats, no flavour-compounds are released by the green beans - only caffeine is released. This leaves us with (almost) decaffeinated beans that can be roasted to make coffee. It is impossible to completely decaffeinate the coffee. Given that the world’s only Swiss Water decaffeination facility is based in Canada and so therefore the beans must be transported large distances – especially when bringing them to Australia – the process does not seem very energy efficient. Presumably, a lot of water is also used. There are various online debates as to whether this is the most sustainable process for coffee decaffeination. Read here and here for more on decaffeination. Carbon filtering uses activated carbon, which is a form of carbon (usually derived from charcoal) that is extremely porous. This gives it a very large surface area, which can adsorb contaminants in the water. Note that adsorption is different to absorption. Adsorption is the bonding of material onto the surface of another material by intermolecular forces – that is, it gets stuck on the surface. Absorption is the incorporation of one substance into another – that is, one substance penetrates the interior of the other. One gram of activated carbon has a surface area around 500 m2, and this incredible surface area means that a large amount of contaminant material can accumulate on the surface. Carbon filters are good at pulling organic compounds like caffeine out of water. As the flavour-compounds are also organic, the carbon filters used here need to be caffeine specific. To do this, the carbon filter is coated in a caffeine-specific solvent layer. According to patent 4324840, this coating could consist of petroleum oils, triglycerides, fatty acids, fatty alcohols and other water-immiscible materials. This is dissolved up in hexane, which is then piped through the carbon-filter. The hexane, being volatile, then evaporates away leaving the filter coated in a caffeine-specific adsorption layer. When you think about it, it's hardly chemical free! Manuel ran an event called The Science of Cocktails during the Ultimo Science Festival. It was a fantastic event, and apart from learning how to make margaritas and martinis, Manuel took us on the cocktail making journey, explaining why making cocktails has far more to do with the scientific method than it does a random artistic process. He also explained why some drinks pick you up (tequila), others make you angry (rum), and some can clear the mind (absinthe) - as well as the science of mixology - why some alcohols mix well and other's don't. This is largely due to the interplay of the various tastes (sweet, sour, bitter, salt, umami) and the smell of the drink. And what exactly is a molecular cocktail? Read more on the event over at 10daysofscience. Town hall bans staff from using Facebook after they each waste 572 hours in ONE month. I found this article courtesy of the excellent science blog, The Lay Scientist. On first reading that headline from The UK's The Daily Mail, it would seem that 572 hours is an extremely large amount of time for one person to spend on Facebook in one month. The article says that over the last year, the 4500 employees of Portsmouth City Council have spent on average 413 hours a month on Facebook while at work, peaking at 572. If we assume there are 30 working days a month (that is, the employees are very keen and work weekends), this means on average they spend almost 14 hours a day on Facebook. Each! If we look a little more carefully and assume a 40-hour week and a 22-working-day month, this comes to 180 working hours, well below the 413 Facebook average! The problem of course is the word EACH in the title, and The Daily Mail has since removed it from the online story. If we remove the offending word, as The Lay Scientist has done, we can see that the average employee with Portsmouth City Council staff spends 20.8 seconds using Facebook each day. If anything I think the council should be commended! This would be an example of some bad stats (or more to the point, bad arithmetic). The Sydney Morning Hearld published an interesting article on the recent spate of off-field incidents by Australian Rugby League players. 2009 has been a horror year for League, with new players seemingly in trouble with the law every week. The article used data from NSW Bureau of Crime Statistics and Research to compare the rate at which players are charged with assault, with the prevailing rate for all males aged 18 to 34 in NSW. They found that across the state, young men are charged with assault at a rate of about 700 per 100,000 each year - you can look this up yourself on the NSW Bureau of Crime Statistics and Research website, although I couldn't find it split by age. In the 12 months to March 31, out of the 400 players who play in the NRL, only three were charged with assault. The article then suggests that this rate of 750 per 100,000 is only slightly above the NSW figure and so therefore League players really aren't that bad. The biggest problem with this statistic is sample size, which the article itself concedes. You can't draw too many conclusions when the addition of only a couple more assaults would double the NRL assault rate - to prove a significant difference between two data sets, you need to have a large sample size. With a small sample size and a very low assault rate, even if the assault rates look similar, you can't conclusively say very much. The other problems include the fact that the data doesn't look at the year post March 31 - which has been the NRL's annus horribilis - except for a passing reference that it looks like it could be a bad year for the NRL given that three players have already been charged with assault and there are seven months left till next March. The data also does not take into account that many of the crimes NRL players have committed are not assault but fall into other categories. However, the article concedes all this - so why was it published? Despite the fact that the word "statistics" has been used in the headline to add weight to the argument, the correct interpretation of these particular statistics is to say that very little has been proven. If you sampled your local gaol or down-town Johannesburg, a sample size of 400 for a crime that usually has a very low rate might prove significant, but that's not the case here. Perhaps we have proven that the NRL is better than a bunch of criminals - I guess that's something! The issue here is that people remember the headline. Even though the article was entirely correct in what it said - it mentioned all the statistical concessions we've listed here, and even put the word "might" in the headline - readers will remember that "statistics showed" that League players are just like you and I. I posted about a similar topic a couple of years back when The Independent on Sunday presented a graph of the oil price between 2000 and 2008, and on the same chart plotted the Nasdaq technology index between 1992 and 2000. The two plots showed a startling similarity, even though they are completely unrelated and even though the article conceded this point very early. However, at first glance you are mislead, and this is what people remember - I somewhat cheekily plotted the performance of the Australian cricket team on the same chart to make this point - it was an even better correlation! You can draw your own conclusions on the behaviour of League players. Of course, wikipedia has a list of off-field incidents involving league players for you to peruse! Edit: I thought it worth taking a look at some of the stats - using a 2-tailed t test, with a sample size of 400, if 9 players committed assault in a year, then you could say that NRL players are more likely to commit assault than the general public. This corresponds to a rate of 2250 per 100,000 - three times what we had before. This could essentially be a big night out for NRL players at the end of the season! What this suggests is that a small difference can make a big result, and this is why we can't draw too many conclusions about League behaviour from this data. If there were a pool of 4000 NRL players, you could start to draw conclusions on NRL behaviour if 40 committed assault - this is a rate of 1000 per 100,000 - considerably less than the case for a pool of 400. It is dangerous to quote "rates" when you don't have much data. The other point is that failing to show that two data sets are significantly different - that is, that NRL players are no different to the state as a whole - doesn't mean that they are the same. As we have seen, when only a few more assaults would make a very large difference, the system is not very stable.